Hilomast Plug-n-Go compressors are available in either 12V DC or 115V AC. The simple-to-operate Hilomast Plug-n-Go compressor includes: a regulator, a pressure cut-off switch, an electronic dump valve, and a psi gauge. 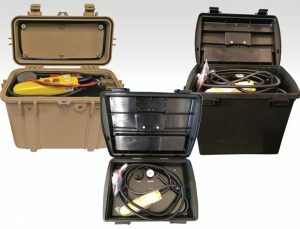 The Hilomast Plug-n-Go design and size offers easy operation and portability making it ideal for on-the-road use (i.e. broadcast vehicles). An electronic quick dump safety exhaust offers fast, but safe, mast retraction. The Hilomast Plug-n-Go compressor comes standard in a rugged, water-resistant case with a handle. Optional colors (based upon availability) include: camouflage, black or tan. All Hilomast Plug-n-Go compressors are CE & UL rated.